Does every person need the same amount of hours dosing and dreaming every night or is it an individual thing? Sleep like a baby? That's an expression to take to heart. 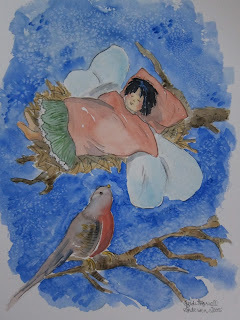 How many of us can sleep like a baby, oblivious to everything around us, and just rest. I am blessed with good sleeping rhythm. I am so grateful for that. I need my sleep. I don't function at all without it.Who can? I admire those who manage to stay friendly and get a grip of daily activities with a constant lack of sleep. Still, when morning comes, My eyelids slowly open a narrow slit and let the morning light say hello. After a few minutes of calculating which day it is and giving thanks for another day, I stumble out of bed--aches and pains here and there--and start the regularity of morning. I have responsibilities, work, and chores that need to be fulfilled, no matter how clumsy my hands are and no matter how many walls I bump into. Besides sometimes I am totally tired from dreaming! · Eat a large meal or drink lots of fluids right before bed. · When you can’t sleep, just lie there and suffer. · Try to sleep somewhere that is too cold, too warm, or too noisy. · Use your bedroom as a stimulating multipurpose room. · When you get busy, just sleep less. · Stay active until the moment you hop into bed. · Vary your sleep time from one day to the next. · Don't feed cat before you go to bed (meows until you feed him). · Feed cat before you go to bed (barfs from highest spot in house). · Don't close lid to piano (at 2am, he'll walk across it playing the scariest death song ever). Doesn't sound too hard, does it? Especially since we don't even have a cat. Today's water color is a sleeping fairy. It always reminds me of Tiffany.